Separated by a couple of years and only a few miles growing up in Crittenden County, Jonathan McMackin and Chase Matthews were never closer than on March 19, 2007. On that day, McMackin dragged a critically wounded Matthews from a burning humvee north of Baghdad, Iraq, despite his own broken leg and fragmentation wounds from an improvised explosive device. In addition to Matthews, who was driving the scout vehicle for fuel tankers headed south on the main supply route from Baghdad to Basra, the transport’s gunner, too, had been seriously injured in the blast. McMackin, according to his commendation, also fought off small arms fire during the ambush to assist his fellow soldiers, one pinned in the blazing vehicle and another knocked unconscious in the explosion. Sgt. McMackin and Spec. Matthews, both graduates of Crittenden County High School now in their mid-20s, were soldiers with Bravo Company of 2nd Battalion at the time of the attack upon their convoy. Matthews, of Dycusburg, lost portions of both legs and much of the mobility in his left arm. The vehicle's gunner, also saved from the blazing humvee commanded by McMackin, was a Guard soldier from Minnesota. His actions "undoubtedly saved Spec. Matthews' life," read 1st Lt. P. Barkley Hughes as Farley pinned the Bronze Star upon the uniformed chest of McMackin. The sergeant saluted his commanding officer as the 44 other soldiers who deployed with Bravo Company in 2006, as well as their their families, rose to applaud the actions of the Marion native. This all took place Sunday during the National Guard's Freedom Salute to all the citizens soldier who deployed to Iraq with the Marion unit. "He was in the right place at the right time," Farley said of McMackin, following the hour-long ceremony held at the Carson Davidson National Guard Armory in Marion. Matthews, who had just returned in time for the Thanksgiving holiday to his Crittenden County home from almost two months of continued rehab and therapy at Walter Reed Army Medical Center in Washington, D.C., did not attend Sunday's recognition ceremony. 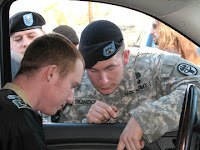 Instead, he sat outside the armory, far from the spotlight, in his shiny, new black SUV, patiently waited for his fellow soldiers to stop by for a handshake visit. His shy demeanor did not mask the pleasure he seemed enjoyed as the soldiers and their families greeted the quiet red-head. "I don't think this could have happened to another guy in this unit that could have dealt with with this the way he has," the lieutenant colonel said of Matthews' uplifting nature. "I believe you could knock him in the head with sledgehammer, and he'd tell you he deserved it." McMackin, the man who pulled his hometown buddy from the wreckage on that day in March, patiently waited for the crowd that had gathered around Matthews' SUV to filter away. When he leaned his head through Matthews’ open window, the two shared a few memories and some congratulations. Neither seems comfortable with the attention each has received.With a familiar smile on his face, Matthews said he returns to Washington Dec. 9 for ongoing therapy. His father Rudy, who has been by his son's side the entire time of his recovery, will undoubtedly also return to Walter Reed at that time. Spec. Matthews is still a member of Bravo Company, despite his injuries. He will remain a soldier until the Army clears him medically. McMackin has recovered, and remains with the Marion unit, though a restructuring of the Kentucky Army National Guard has reorganized the former tanker unit of Bravo Company into an a detachment of A Company, 206th Engineer Battalion in Lietchfield, Ky. McMackin, who lives in Marion with is wife Megan, will likely retrain for duty with an engineering unit and remain in Marion. Sgt. Mike Little, a former full-time recruiter with Bravo Company who enlisted both Matthews and McMackin, said the Army couldn't ask for two better soldiers. Little, also of Crittenden County, joined the local unit last weekend for its first time back in uniformed training since returning from Iraq this summer.Another soldier assigned to Bravo Company while in Iraq, Sgt. Thomas W. Clemons, 37, of Leitchfield, died of a heart attack last December while in Iraq. His family was also on hand Sunday to be recognized for their sacrifice. It started by giving away a toothbrush, a phone card, a jug of laundry soap. Now Micheal Sparling, 56, of Greenwood Township coordinates the donation of larger and more expensive items such as a wheelchairs, Segway motorized transports and financial grants to soldiers and veterans in need. Sparling has spent two years watching families cope as their loved ones undergo surgery at Walter Reed Army Medical Center in Bethesda, Md. He's watched soldiers recover from battle wounds only to find a rough path ahead. Amputees must learn to live without an arm or a leg, learn how to walk with prostheses or see the world from a wheelchair. They discover their bodies are not the same as before they went to Iraq or Afghanistan. Although the cost of surgery and rehabilitation for soldiers is covered by the military, other expenses and needs arise, Mike Sparling said. He's spent two years watching his son Sgt. Josh Sparling, 26, undergo 45 surgeries at Walter Reed and knows the struggle. Military families sometimes have to drop everything to support their loved ones, Sparling said. "Either mom or dad's had to quit their job ... It's not like they're not in debt already. They still have all the bills they've had before, and they don't have the income. Somebody's got to fill that gap. We're proud that we do." After starting small in May, America's Wounded Heroes today is known as an organization that military members and their families can turn to in times of need. It's also designed to support other "heroes," who protect Americans and are hurt in the line of duty: police officers, firefighters and emergency medical technicians. When first elected 4 years ago, Ernie Fletcher (R) was Kentucky's first Republican governor in more than 30 years. But his administration, the AP reports, was dogged by an investigation into political interference in state hiring that led to Fletcher's indictment on three misdemeanor charges. Tonight, Kentucky has elected Democrat Steve Beshear to the governor's post, halting Fletcher from serving a second term. Paducah, Ky., Jan. 20 - Intense excitement exists at Dycusburg, thirty miles below here, on the Cumberland River, over a threat to burn the town to-night. There is no telegraph station at Dycusburg, and no boat until to-morrow. The Rev. Mr. Fox, pastor of the colored Baptist Church, is at the bottom of the excitement. Saturday night a mob of fifty masked men went to his house for the purpose of handling him roughly, but he escaped, though pursued and fired upon. Preacher Fox was accussed of paying too much attention to the women of his congregration, and is said to have been the cause of breaking up several families. Fox is married. A large number of the church people have taken the side of Fox, and, is is said, have threatened to burn the town in retaliation for the attack by the mob. That this threat is not regarded as idle is shown by the action of the Trustees to-day in organizing a guard to patrol and protect the town. The citizens who warned Fox to leave town say they only did so after making sure that he was an undesirable citizen, to say nothing of his desirability as a spiritual adviser. The Baptist church hosted their annual Fall Festival on Friday night. It was a huge success complete with a clown who had a pocket full of ice cream cone toys for the kids and buggy rides from Justin and Brody Sutton. The cakewalk was a favorite activity as well as bingo. The kids loved the duck pond -- they got to play in the water! Each child left with their pockets full of toys. A potluck chili and sandwich supper was served. Everyone had a nice time. The church hosts the fall festival each year in October. Sincere condolences to the family of Vanessa Lindsey Waggoner Porterfield. Our community was saddened by her passing last week. Vanessa was a friend of mine since first grade. Despite hard times and sickness, she always had a smile on her face and a laugh in her voice. She will be missed but Heaven is a better place because she is there. The Dycusburg Community Fund Committee is accepting recipes for a community cookbook. Deadline is Nov. 15. Printing is scheduled for early 2008. Recipes may be mailed to PO Box 59, Dycusburg, KY 42037 or emailed to tcochrum1@localnet.com. We are seeking recipes from families from Dycusburg residents, current and former and stories to go along with the recipes if you have any. It seems that as Christmas approaches, Matthew T. Patton tends to get more e-mail about Dycusburg books. At this point, he has none in his inventory. He would be willing to order some more if enough folks are interested. Please e-mail him at matthewtpatton@yahoo.com if you would like to add your name to the running list for the next printing. Saturday, October 27 is national "Make a Difference in your Community Day." Activities are being scheduled; anyone who wants to help be in town Saturday morning. The Dycusburg community committee is seeking donations for a veteran’s memorial monument and flagpoles. We are offering chances on a country ham and a $50 gift certificate to the Food Giant for a donation of $1-$5. Drawings will be held Nov. 13. Bro. Chris Clark will speak at the Baptist church on Sunday and a potluck dinner will follow. Everyone is invited to attend and hear about Bro. Clark’s rodeo ministry.